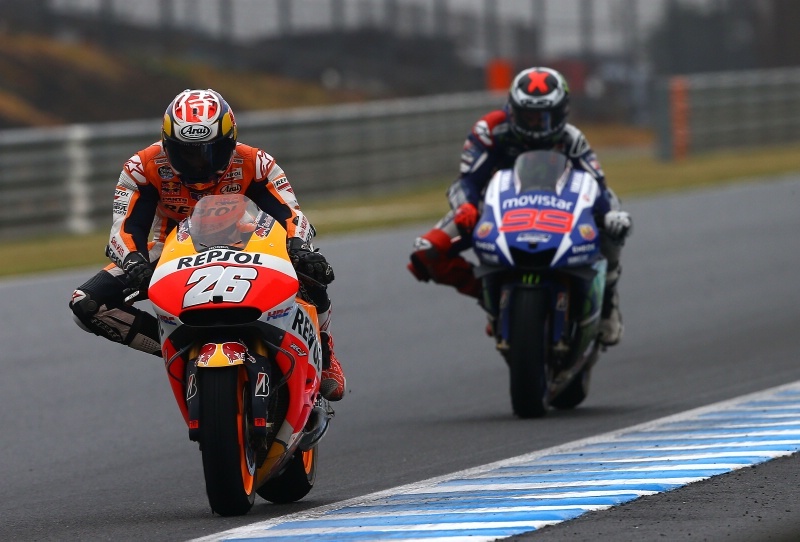 Dani Pedrosa claimed his 50th Grand Prix victory in the Japanese MotoGP at Motegi. The Spaniard beat title leader Valentino Rossi and fellow Spaniard Jorge Lorenzo to the chequered flag, whilst team mate Marc Marquez could only finish fourth. Pole man Lorenzo set the pace early on, but as the race went on he was plagued with tyre problems. Pedrosa worked his way past Rossi with eight laps to go before powering in to the lead on the next lap. Lorenzo’s tyre problems were evident when Rossi caught him, running extremely wide to allow his team mate to slip past. Marc Marquez caught Andrea Dovizioso late on to take fourth, whilst Cal Crutchlow overtook fellow Brit Bradley Smith in the final few corners to claim sixth. Scott Redding finished tenth, with Eugene Laverty seventeenth. Rossi’s second place extends his championship lead to 18 points with three races remaining, whilst Marc Marquez is now unable to retain his crown, 86 points behind the Italian. Johann Zarco was awarded the Moto2 title before the race, with closest challenger Tito Rabat’s weekend being cut short through injury. Zarco celebrated his title with another win in a rain affected race, whilst Danny Kent will have to wait to secure the Moto3 title, finishing sixth, with Niccolo Antonelli taking the win. Alvaro Bautista will have to lie low whenever he returns to Italy, after knocking off Italian legend Valentino Rossi on just the 3rd corner of the race. Rossi, who qualified 7th, didn’t have the best of starts, leading to him being caught up in the thick of the action. Jorge Lorenzo led from the first corner, where he overtook Dani Pedrosa, who out-qualified him with a Pole-position lap record on the final lap of Q2. Lorenzo went of to gap the two Repsol Hondas to get a 5 second lead. Marc Marquez, who qualified 6th after crashing in every session apart from qualifying, fought his way up to 3rd behind his team mate. With about 10 laps to go, Pedrosa’s lap time fell, allowing Lorenzo to escape and holding up Marquez. Marquez passed Pedrosa with 5 laps to go through turn 5, however he crashed 2 laps later after the bike folded beneath him. This mistake allowed Brit Cal Crutchlow an unlikely podium, his 2nd consecutive rostrum. Crutchlow was having a lonely race, after passing his former team mate Dovizioso early on, and having a 4 second buffer both in front and behind him. But when Pedrosa started to have problems, Cal began hunting down the hondas, taking about half a second-a-lap out of the Repsols. Further down, Stefan Bradl got his highest finish of the season in 4th, beating the highest placed Italian Andrea Dovizioso, who had started on the front row, and Nicky Hayden. Another Ducati, test rider Michele Pirro came 7th, with Aleix Espargaro taking up his usual place of top CRT in 8th.Bradley Smith finished off a painful weekend in 9th, while fellow Brit Michael Laverty finished 17th. Lorenzo’s victory sees him overtake Marquez in the championship, now just 12 points behind Dani Pedrosa, Crutchlow’s 3rd sees him move closer to Marquez, just 6 points behind, whilst Dovi overtook Valentino Rossi in 5th place. In Moto2, Brit Scott Redding took his Championship lead to 43 points with a comfortable second win in a row as he pushes for a MotoGP ride next year. Luis Salom won in the Moto3 race. Young prodigy Marc Marquez became the youngest ever winner of a Moto GP race in Texas at the tender age of just 20 years and 63 days old. Marquez, who became the youngest rider to qualify on pole during on Saturday, passed team-mate Dani Pedrosa on lap 13 at the inaugural race in Austin. World champion Jorge Lorenzo had a quiet race in third place from start to finish, with his Yamaha struggling to keep up with the Honda’s speed down the straights. Lorenzo’s lap times picked towards the end of the race to finish almost 2 seconds behind Dani Pedrosa, who fell away with 2 laps to go, citing “losing the strength in his left arm through the chicane section” for the 1.5 second gap from the race winner. As in Qatar, Britain’s Cal Crutchlow initially got stuck in 5th behind Stefan Bradl, before running off the track on lap 4. He lost little time though, rejoining the action having only dropped 1 place to Alvaro Bautista. Crutchlow passed Bautista through the chicanes on the next lap. The Monster Yamaha man then made up a 1.2 second gap to pass Stefan Bradl on lap 8, slipping through as the German ran slightly wide. Nine time world champion Valentino Rossi finished 6th with Aleix Espargaro again the leading CRT in 11th, ahead of 2 satellite bikes. Brits Bradley Smith and Michael Laverty finished 12th and 16th respectively. 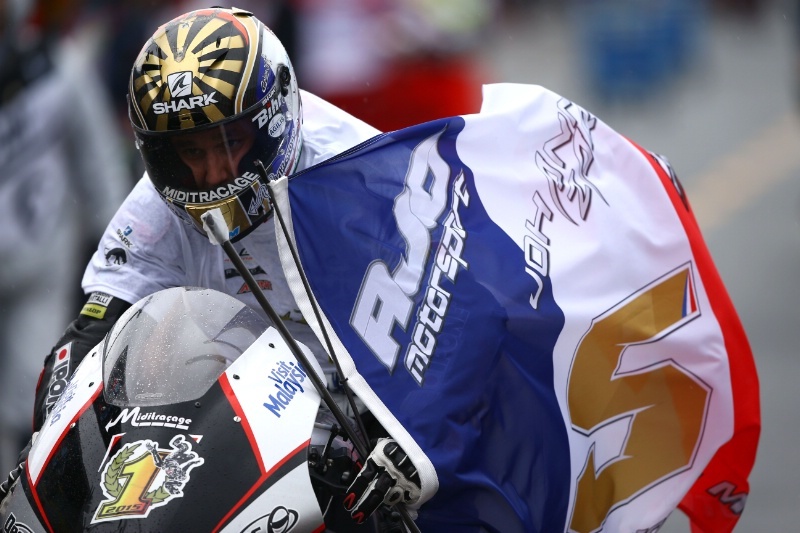 In front of a home crowd Ben Spies finished 13th and the ‘Texas Tornado’ Colin Edwards was forced to retire. It was a Spanish hat-trick as Nico Terol won in Moto2 and Alex Rins won in Moto3. The opening round of the 2013 MotoGP season saw the prolific return to form of Valentino Rossi. The Italian, 34, started from seventh on the grid, and appeared to get stuck behind Stefan Bradl before passing the German after 8 laps. Bradl then crashed out a lap later trying to retake 5th place as he strayed on the the dusty part of the track. Rossi the made up a 3.737 second gap to overtake Britain’s Cal Crutchlow at the first corner on lap 19, forcing the Satellite Yamaha rider to run off the track. The nine-time world champion the passed Dani Pedrosa and rookie Marc Marquez in the next two laps, setting up an enthralling duel that set up a battle which has rarely been seen since Rossi’s nightmare switch to Ducati. The rookie Marquez, who is tipped by many to fight for the title this year, jostled with Rossi for the next 3 laps, in a contest fitting of the madness of Moto2. He finished second, almost 6 seconds behind run-away leader Jorge Lorenzo, who led the race from start to finish. Marc Marquez rounded off the podium in third whilst last season’s championship runner up Dani Pedrosa dropped to 4th. Britain’s Cal Crutchlow came 5th, whilst other Brits fared poorly, with Bradley Smith, Crutchlow’s team-mate, crashing out of 11th place 5 laps in to his debut, and Michael Laverty finished 17th on his Paul Bird Motorcycle. Aleix Espargaro finished the leading CRT in 11th place. Aleix’s brother Pol won the Moto2 race and Luis Salom won in Moto3.